April 16: Robertson has been diagnosed with a Grade 1 flexor strain, manager Gabe Kapler said following tonight’s game (Twitter link via the Philadelphia Inquirer’s Matt Breen). He’ll be shut down from throwing for the next couple of days before being reevaluated. April 15: The Phillies announced Monday that they’ve placed right-hander David Robertson on the 10-day injured list due to soreness in his right elbow. Fellow righty Drew Anderson was recalled from Triple-A Lehigh Valley in his place. Robertson tells reporters that he’s had some on-and-off forearm discomfort and is set to receive an MRI tomorrow, though he’s not overly concerned about the issue at the moment (Twitter link via Philly.com’s Scott Lauber). Robertson, 34, signed a two-year contract worth a guaranteed $23MM this winter and has struggled through a slow start to the season. The veteran righty allowed runs in each of his first three appearances with his new club and, overall, has yielded a total of four runs on eight hits and six walks with six strikeouts in 6 2/3 innings of relief. Robertson has thrown just 58 percent of his pitches for strikes in that small sample of innings — a departure from recent seasons when his overall strike rate has sat at 63 percent or better. Notably, this is the first trip time in his career that Robertson has ever missed time due to an arm injury. He spent about two weeks on the shelf due to a groin strain in 2014 and missed a bit more than three weeks due to an oblique injury in 2012, but he came to the Phillies with a pristine track record in terms of arm health. With Robertson sidelined for the time being, Anderson will get a look for a third consecutive season. The 25-year-old hasn’t found much success in the big leagues yet but also hasn’t had much of an opportunity; in 15 Major League frames, he’s surrendered 13 runs on 23 hits with a more impressive 13-to-3 K/BB ratio. Anderson has spent the vast majority of his career as a starter and owns a 3.90 ERA with 7.3 K/9 against 2.6 BB/9 in 115 1/3 innings (21 starts) at the Triple-A level. Greg Holland had a much rougher trip through free agency in the 2017-18 offseason. The veteran reliever described his quest to sign a contract and subsequent rough 2018 season to USA Today’s Bob Nightengale as a situation that “snowballed for me and spiraled out of control for me.” Holland’s services were weighed down by a qualifying offer, and he said that talks with the Rockies abruptly ended after Colorado pivoted to sign Wade Davis rather than wait for Holland to further test the market. As a result, Holland didn’t find a new team until he signed a one-year deal with the Cardinals on Opening Day, and the lack of a proper Spring Training led to disastrous on-field results. “Physically, I felt great, I felt healthy. But you’re throwing to college guys, and a week later you’re pitching in the major leagues in a tie game,” Holland said. “You can only emulate so much of a big-league game….The quicker you can get into a scenario where you’re facing Major League talent on a consistent basis, you’re going to be more successful.” This winter, Holland signed a one-year, $3.25MM deal with the Diamondbacks, as the right-hander looks to get his career back on track. Holland’s slow start could factor into the Cardinals’ decision about pursuing any current free agents this spring, Derrick Goold of the St. Louis Post-Dispatch writes. President of baseball operations John Mozeliak implied that if the team did add any new faces on minor league deals, a stint in extended Spring Training could be required or even “demanded” of any new signing. “So, lesson learned from last year perhaps? I think for sure,” Mozeliak said. “You have to take something away from that. The outcome [with Holland] was not what we wanted. I think we did learn our lesson.” Goold also observes that the Cards could face something of a roster crunch as they juggle multiple out-of-options players, so some trades could potentially come later in the spring. Potential new additions have “not been a heavy part of the discussion” between Cubs skipper Joe Maddon and the front office, Maddon told Gordon Wittenmyer of the Chicago Sun-Times and other reporters. “That doesn’t mean it’s not going to happen; I’m not saying that,” Maddon said. “But…I anticipate what you see showing up tomorrow [at camp], the [Opening Day] group’s going to be derived from that group.” It has been a quiet offseason for a Cubs team that is seemingly dealing with strict budget restraints, as the Northsiders try to stay under the $246MM payroll mark (to avoid a larger luxury tax penalty). Kapler’s ongoing modernization of the Philly bullpen makes Craig Kimbrel a somewhat odd fit, considering he is one of the few tried-and-true closers left in the MLB. Where Kimbrel does fit (besides previous Boston or Atlanta), however, is entirely (and unjustifiably) unclear, per Evan Drellich of NBC Sports Boston. Kimbrel’s case is yet another example of the widening gap between players and teams as front offices become increasingly wary of age decline while focusing their efforts (and their payrolls) on value spending. He may not be worth the 6-year, $100MM commitment reported to be the starting ask, but there ought to be more interest for a 30-year-old closer with a proven track record (1.91 ERA, 1.96 FIP, 2.16 xFIP) that is supported by underlying success (14.67 K/9 to 3.46 BB/9, 0.59 HR/9). With Robertson in hand and seven out-of-options relievers on their 40-man roster, thinning a now-overcrowded bullpen is next on Philadelphia’s offseason docket, per the Athletic’s Matt Gelb. Veterans Pat Neshek and Tommy Hunter could be the odd men out if the Phils can find a trade partner. Along with the power trio of Robertson, Dominguez, and Neris, recent offseason acquisitions Juan Nicasio (from the Mariners) and Jose Alvarez (from the Angels) would seem to be locks for the pen on Opening Day. Hunter, specifically, was acquired because of his reverse-split ability to retire left-handers, which could now make him vulnerable given Robertson’s skills in the same area. Alvarez, projected to make only $1.7MM this year, would be the easiest to flip, but they probably prefer to move one of their higher-priced expirings like Hunter ($9MM), Nicasio ($9.25MM) or Neshek, who is guaranteed $8.5MM including a buyout for 2020. Unless the price for Dallas Keuchel drops significantly, the Phillies seem done shopping for arms, at least until midseason, per Gelb. Aaron Nola and Jake Arrieta head the Philly rotation, but GM Matt Klentak believes in the high floor provided by the depth behind those two, both at the major league level and in Triple A. Nick Pivetta, Vince Velasquez and Zach Eflin round out the rotation, but the renewed health of Jerad Eickhoff provides further flexibility should one of the above trio stumble. Regardless, the Phillies like their current group, and any upgrade would need to be significant. Patrick Corbin provided that kind of upside, but with the former Dback now in Washington, there doesn’t appear to be another available starter the Phils deem worthy of a significant acquisition cost. The next few weeks of free agent hunting figure to focus on the big fish, after which offensive plan B’s or even a reengagement on Kimbrel would likely take precedence over adding another starter. 7:00pm: Robertson’s deal does contain a range of incentives, per Jon Heyman of Fancred. The 33-year-old will be awarded $50K each for an All-Star appearance, Gold Glove award, or League Championship Series MVP award, and $100K if he’s awarded MVP of the World Series or wins the Cy Young (plus $50K for finishing second, and $25K for a third-place finish). He’ll also donate 1% of his salary to the team’s charity fund. 1:00pm: The Phillies have announced the signing. Because they had two open spots on the 40-man roster, a corresponding move was not necessary. 12:29pm: The Phillies have agreed to a two-year, $23MM contract with free-agent reliever David Robertson, reports Mark Feinsand of MLB.com (via Twitter). The contract contains a $12MM club option for a third season, and Robertson has already passed his physical. He’ll earn $10MM in 2019, $11MM in 2020 and is guaranteed at least a $2MM buyout on the 2021 option. If the option is picked up, the self-represented Robertson would take home a total of $33MM over three years. Robertson, 33, has been among the game’s most consistent relievers since emerging as a regular more than a decade ago. He’s totaled at least 60 innings and 60 appearances per season dating back to 2010 and hasn’t been on the disabled list since 2014, when he missed the minimum amount of time due to a mild groin strain. Robertson is fresh off a quality 3.23 ERA with 11.8 K/9, 3.4 BB/9, 0.9 HR/9 and a 45.3 percent ground-ball rate in 69 2/3 innings with the Yankees. He kept his ERA south of 3.50 and averaged at least 10.8 punchouts per nine innings in all four seasons of his the four-year $46MM pact he signed with the White Sox. His 2017 season — 1.84 ERA, 12.9 K/9, 3.0 BB/9, 2.57 FIP, 2.76 xFIP through 68 1/3 innings between Chicago and New York — was particularly brilliant. After spending his entire career to date in the American League, Robertson will head to the National League for the first time, where he’ll pair with breakout 2018 rookie Seranthony Dominguez at the back of a Philadelphia bullpen that also features veterans Tommy Hunter, Pat Neshek and Juan Nicasio, in addition to lefties James Pazos and Jose Alvarez. Hector Neris, Edubray Ramos, Yacksel Rios and Victor Arano are among the other bullpen options for the Phillies, but it presently stands to reason that Dominguez and Robertson will team to handle the majority of the high-leverage innings in Philadelphia. To that end, Scott Lauber of the Philadelphia Inquirer tweets that the Phillies’ intention with Robertson is to use him “whenever the game is on the line, regardless of inning.” That should put Robertson firmly in the mix for some saves in Philadelphia, but he’ll also likely be called upon to help escape jams earlier in the game. In those instances, Dominguez could then be in line for more conventional save opportunities. Robertson is the latest addition in an offseason that has been rife with turnover for the Phillies after GM Matt Klentak promised changes were coming on the heels of a historic late collapse. Since their season ended in catastrophic fashion, the Phillies have shipped out Carlos Santana, signed Andrew McCutchen and acquired each of Nicasio, Pazos and Jean Segura on the trade market. The heaviest lifting for the Phillies may very well be yet to come, though, as the Phillies have been linked to top free agents Bryce Harper and Manny Machado more strongly than virtually any team in baseball. The Robertson contract falls rather closely in line with the two-year, $25MM contract that Andrew Miller landed with the Cardinals, perhaps further serving to establish the market for the tier of veteran relievers just below top available arm Craig Kimbrel. The Phillies and Yankees were both rumored to be in the mix for Robertson, Zach Britton and Adam Ottavino, so with Robertson now off the board, both Britton and Ottavino could see their markets accelerate. Fancred’s Jon Heyman first suggested that a deal between the two sides appeared to be getting close (via Twitter), and The Athletic’s Jayson Stark had reported shortly beforehand that there was “lots” of talk surrounding the Phillies and Robertson (Twitter links). Seven-time All-Star closer Craig Kimbrel entered the winter as the undisputed No. 1 reliever available in free agency, but it’s not as easy to identify the second-best option on the open market. When the offseason commenced, MLBTR’s Tim Dierkes, Steve Adams and Jeff Todd lumped four relievers close together behind Kimbrel in terms of projected earning power. They forecast that Jeurys Familia, David Robertson and Zach Britton would each earn three-year, $33MM contracts, while Adam Ottavino would come in a bit behind at three years and $30MM. Familia’s now off the board, having rejoined the Mets on a three-year, $30MM guarantee, while fellow bullpen arms Andrew Miller, Joe Kelly and Joakim Soria have also received lucrative contracts. With Familia, Miller, Kelly and Soria no longer in the free-agent mix, it’s clear that Robertson, Britton and Ottavino are the most desirable non-Kimbrel relievers without teams. There has been widespread interest in all three over the past couple months, with some of the same clubs in contention for multiple members of the group. But who’s the most appealing hurler among the trio? Perhaps the answer is the right-handed Robertson, who has put together nine straight highly productive seasons of 60-plus innings. Undoubtedly one of the most durable and effective relievers in recent memory, the longtime Yankee is coming off a season in which he logged a 3.23 ERA/2.97 FIP with 11.76 K/9, 3.36 BB/9 and a 45.3 percent groundball rate across a career-best 69 2/3 innings. Never one to rely on high-90s velocity, Robertson continued to confound hitters with his breaking stuff, as FanGraphs rated his curve as the most valuable pitch of its kind among 2018 relievers. Batters posted a dreadful .196 weighted on-base average against that pitch and an even worse .145 mark when he threw his slider, according to Statcast. If there’s one concern with Robertson, it’s his age. He’s set to turn 34 in April, meaning it’s fair to wonder whether he’ll continue to thrive over the course of a multiyear deal. Britton, meanwhile, is three years younger, having turned 31 on Dec. 22. Aside from Kimbrel, Britton likely had the best peak of anyone in this winter’s class of free-agent relievers. The left-hander amassed anywhere from 65 2/3 innings to 76 1/3 in each season as the Orioles’ closer between 2014-16, a three-year span in which he converted 120 of 128 save opportunities, led relievers in groundball rate (77.9 percent), placed second in ERA (1.38) and recorded 9.26 K/9 against 2.37 BB/9. Britton was close to infallible during his heyday, but he fell off between 2017-18, when forearm, knee and Achilles injuries limited him to 78 innings. Britton still managed a terrific 3.00 ERA and a fantastic 72.8 percent grounder rate in that period, which he spent with the O’s and Yankees. His K/9 (7.27) and BB/9 (4.5) each went in the wrong direction, though, and his power sinker wasn’t as imposing. Unlike Robertson and Britton, Ottavino brings little game-ending experience to the table, evidenced by his 17 career saves. He’s also a onetime Tommy John surgery patient and a 33-year-old whose career with the Cardinals and Rockies hasn’t been all that consistent. The righty has put together a handful of outstanding seasons and a few poor campaigns, though it seems he found another gear in 2018. After a woeful 2017 in Colorado, Ottavino spent last offseason working to improve his command in his native New York City, as former FanGraphs writer Travis Sawchik detailed in May, and the results were astounding. Using primarily sliders and sinkers, Ottavino pitched to a 2.43 ERA/2.74 FIP with 12.98 K/9 and 4.17 BB/9 across a personal-best 77 2/3 frames last season. In the process, his first-pitch strike rate increased nearly 14 percent from 2017 and his out-of-zone swing rate climbed by almost 5 percent. Further, as Mike Petriello of MLB.com pointed out in October, Ottavino was a soft-contact wiz in 2018, trailing only all-world relievers Edwin Diaz and Blake Treinen in xwOBA against (.229; Robertson’s was .276, while Britton checked in at .311). Although it’s obvious that Ottavino’s career has been less impressive than those of Robertson and Britton, it’s possible he’s the best of the three right now. Cases could be made for both Robertson and Britton, however, and it’ll be interesting to see how much guaranteed money these three high-end relievers ultimately receive in the coming weeks. Which one would you sign? The Mariners have grown “increasingly confident” they’ll be able to trade designated hitter/first baseman Edwin Encarnacion before their spring training opens, Jon Morosi of MLB.com says (video link). Encarnacion’s market has picked up in the wake of the Twins’ agreement with Nelson Cruz, whose suitors are now turning to the former. The Rays, White Sox and Astros are each “involved” on both Encarnacion and Cardinals first baseman/outfielder Jose Martinez, according to Morosi. Encarnacion was already part of one trading involving the Rays this offseason – a three-team deal in which Cleveland sent him to to Seattle. The soon-to-be 36-year-old has been superfluous to the rebuilding Mariners’ roster since they acquired him, though, and the team likely wants to rid itself of as much of his contract as possible. Encarnacion’s owed a guaranteed $25MM through 2020, including a $5MM buyout in lieu of a $20MM club option that year. While Encarnacion was an offensive juggernaut from 2012-17, he’s coming off a somewhat pedestrian season by his standards, as he batted .246/.336/.474 (115 wRC+) in 579 plate appearances and didn’t see much time in the field. Martinez, 30, is hardly a defensive stalwart either, though he did offer quality production at the plate from 2017-18 and will collect a minimal salary in 2019. Encarnacion could become the latest household name to leave Seattle, but it appears outfielder Mitch Haniger will stay put. “We’re not really listening to offers,” Mariners general manager Jerry Dipoto told MLB Network of Haniger (via TJ Cotterill of the Tacoma News Tribune). “They would have to blow us away, and they haven’t even come close.” The 28-year-old “represents everything we want to build around and be about as a team,” Dipoto continued, leading Cotterill to posit that Haniger, fellow outfielder Mallex Smith and left-hander Marco Gonzales figure to form the Mariners’ next veteran core. Haniger is unquestionably the most valuable player of the trio, given his superb production from 2017-18 and four remaining years of control (including one more pre-arb campaign). Before the Rangers traded him to the Athletics on Dec. 21, the Yankees were among the teams with interest in infielder Jurickson Profar, per Gerry Fraley of the Dallas Morning News. However, New York wasn’t “willing to give up much” for Profar, Fraley writes. Texas received four minor leaguers and $750K in international bonus room for Profar, who’d have helped the Yankees cover for injured shortstop Didi Gregorius’ absence in 2019. Had the Yankees gotten Profar, whom they also showed interest in last offseason, he likely would have handled second base, thus sending Gleyber Torres to short. Although, with third baseman Miguel Andujar potentially on the block and free-agent shortstop/third baseman Manny Machado on the Yankees’ radar, it’s anyone’s guess how their infield would have aligned with Profar in it. With Machado’s future up in the air for at least a few more days, the Yankees are currently focused on their bullpen, Jon Heyman of Fancred tweets. Free agents David Robertson, Zach Britton and Adam Ottavino remain “in play” for the Yanks, who could sign more than one of those hurlers, Heyman notes. New York’s known to be in the market for two relievers, as it could lose both Robertson and Britton to other clubs. The Angels have interest in adding right-hander David Robertson to the back of their bullpen, per MLB.com’s Jon Morosi (Twitter link). As he points out, Angels general manager Billy Eppler is quite familiar with Robertson due to his time as an assistant GM with the Yankees. While Robertson’s reported preference is to pitch in the northeastern part of the country — he’s an Alabama native but now resides in Rhode Island — the Angels could give him the opportunity to pitch in the ninth inning, which could well appeal to the self-represented veteran. Robertson, 33, has been among the game’s most consistent relievers since emerging as a regular more than a decade ago. He’s totaled at least 60 innings and 60 appearances per season dating back to 2010 and hasn’t been on the disabled list since 2014, when he missed the minimum amount of time due to a mild groin strain. It stands to reason that for a team that has had an overwhelming barrage of injuries throughout the pitching staff, Robertson’s durability and consistency would hold extra appeal. The Angels have run through a carousel of closers in recent seasons. Blake Parker, Cam Bedrosian, Keynan Middleton, Bud Norris, Huston Street, Andrew Bailey, Fernando Salas and Joe Smith have all logged at least six saves in a single season since 2016, and the Halos haven’t had a consistent ninth-inning presence since Street’s 40-save showing in 2015. Of that bunch, only Middleton (recovering from Tommy John surgery) and Bedrosian remain with the organization. Adding Robertson to the mix would give the Angels a much more definitive option at the back end of the ’pen and allow in-house closing candidates like Ty Buttrey, Justin Anderson and Bedrosian to pitch in a setup capacity. Eppler and his staff have already made a pair of additions to the rotation, bringing both Matt Harvey and Trevor Cahill on board last week. Those two signings pushed the Angels’ projected Opening Day payroll to around $163MM, which is more or less in line with the Opening Day payrolls authorized by owner Arte Moreno in each of the past three seasons. Adding Robertson, or virtually any other free agent of note, would push the Angels to a new record in terms of Opening Day payroll, although they finished out the 2016 and 2017 seasons with year-end payrolls in excess of $180MM following trade deadline additions. 10:15pm: There’s still “mutual interest” in a union between Robertson and the Red Sox, Mark Feinsand of MLB.com tweets. Boston is facing plenty of competition, though, as it’s one of “several” clubs vying for Robertson, per Feinsand. 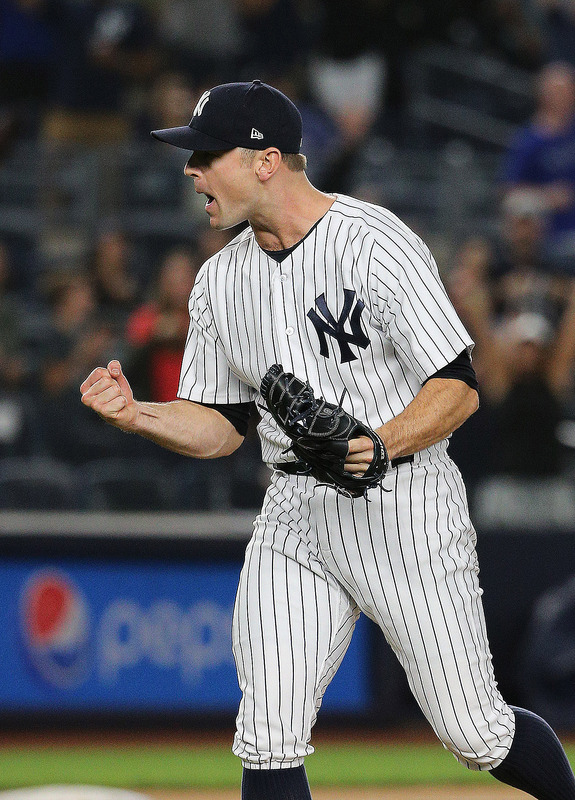 9:21pm: There have been a handful of newsworthy bullpen signings over the past couple weeks, yet one of the majors’ most accomplished relievers – right-hander David Robertson – remains without a contract. While world champion Boston is among the teams that have shown interest in Robertson this offseason, the Red Sox believe they’re unlikely to reel in the longtime Yankee, George A. King III of the New York Post hears. That could be to the advantage of the Phillies, who are interested in Robertson, King reports. Although it doesn’t appear the 33-year-old Robertson will join the BoSox, the fit is obvious. He’s a Rhode Island resident who’d like to remain in the Northeast, where he has spent most of his career, and the Red Sox have needs in their bullpen. They’ve already lost setup man Joe Kelly, who signed with the Dodgers, and could also see star closer Craig Kimbrel wave goodbye in free agency. Robertson is heavily experienced as both a setup man and a closer, and based on his outstanding track record of performance and durability, would be a good bet to step in with aplomb for either Kelly or Kimbrel. Nevertheless, Boston’s reportedly hesitant to offer Robertson more than a two-year deal – thus falling short of MLBTR’s three-year, $33MM prediction – and seems to be hoping for relievers’ prices to drop before committing to anyone. Like the Red Sox, the Phillies would make sense for Robertson from a geographical standpoint. The Phillies could also stand to upgrade their bullpen, though they’ve mostly been connected to left-handed relievers on the rumor circuit. However, Philadelphia witnessed Andrew Miller come off the market Friday, when he signed with the Cardinals, possibly leaving it in “Zach Britton-or-bust” mode when it comes to lefty relievers. Regardless of handedness, Britton or Robertson – the Yankees’ most noteworthy remaining free agents – would either give the Phillies a terrific setup man or a quality closer who’d bump the electrifying Seranthony Dominguez into a different role. Robertson wouldn’t provide the Phillies the southpaw they desire, but it’s worth noting he has been more dominant against left-handed hitters during his career, having held them to a pathetic .186/.267/.278 line while limiting righties to a weak .219/.302/.364 mark. As for the Yankees, with both Robertson and Britton unsigned, they’re in the market for two relievers, King notes. It’s unclear how serious New York is about re-signing Robertson, but it is trying to outmaneuver the Phillies and other teams for Britton, Jon Heyman of Fancred reported this week. No fewer than six teams have “serious interest” in free-agent reliever David Robertson, Mark Feinsand of MLB.com reports. The Dodgers are among that group, according to Feinsand. Shifting to the West Coast would be a major change for the 33-year-old Robertson, who debuted in 2008 and has only pitched for the Yankees and White Sox. A Rhode Island resident who has spent the majority of his career in New York, Robertson would like to remain in the Northeast, Yankees general manager Brian Cashman revealed last month. That preference seems to place the Dodgers behind the 8-ball, then, though they certainly have the financial might to make Robertson a quality offer. MLBTR’s predicting a three-year, $33MM contract for the highly accomplished right-hander. If he joins the Dodgers, Robertson would give the team another capable bridge to closer Kenley Jansen. Robertson has been among the majors’ premier relievers throughout his career, after all, having mixed impressive durability with statistical excellence. He hasn’t thrown fewer than 60 innings in a season since 2009, his second year, and owns a lifetime 2.88 ERA/2.81 FIP with 11.97 K/9, 3.66 BB/9 and a 43.7 percent groundball rate over 657 frames. While Robertson’s numbers took a step backward last year relative to his brilliant 2017 performance, he nonetheless logged a terrific 3.23 ERA/2.97 FIP with 11.76 K/9, 3.36 BB/9 and a 45.3 percent grounder mark across a career-high 69 2/3 innings. In the process, the self-represented Robertson set himself up for yet another sizable payday four years after the White Sox signed him to a $46MM contract in his first trip to free agency.